Having pest problems? Powder Post Beetles, Wood boring Beetles Old House Borer. We can help. Our loyalty lies with you, our clients ... AND we are not paid commissions on beetle control services SOLD like the "Big Boy" companies. Beetle Control CT. Powder Post beetles can be serious pests of structures in the Connecticut area. The larvae of these beetles live in and consume dry, seasoned wood. 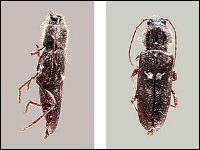 The most common types of powder post beetles are Anobiid, Lyctid, Bostrichid beetles. and Old House Borers. Anobiid powder post beetles ( Figure 1 ) are usually about 1/16 to 1/4 inch long, reddish brown or grayish brown to dark brown. The body is cylindrical, elongated and covered with fine hair. The head is covered by pronotum from top view; the last 3 segments of antennae are usually lengthened and broadened. The larvae are white, "C" shaped grubs with rows of small spines on dorsal side. 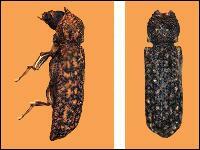 The beetles' life cycle lasts 1 to 10 years depending on the species. Anobiid powder post beetles infest seasoned softwood and the sapwood of seasoned hardwoods. CREDITS: James Castner, University of FloridaFigure 1. Anobiid powderpost beetle. Most commonly in CT, infestations of Anobiid powder post beetles are found in structural timbers made of softwood, such as beams, sills, joists, studs, subflooring, and plywood. In addition, Anobiids will infest hardwood furniture, wall paneling, window and door molding, hardwood floors, and furniture. Woods such as maple, beech, poplar, and pine are especially susceptible to attack. They prefer to infest wood with high moisture content in poorly ventilated areas in crawl spaces of houses, utility rooms, and garages. Under favorable conditions, the infestation then spreads into walls and other areas of the structure. Infestations develop slowly but wood can be reinfested year after year. The key to avoidiing serious problems with Anobiid powder post beetles in CT is early detection and control. Usually, homeowners see the damage rather than the beetles. The larval damage occurs entirely below the surface of the wood where larvae eat tunnels. This damage is not usually seen until the wood disintegrates. However, the adults emerge from the wood leaving emergence holes and powder-like frass that sifts from the holes. Emergence holes from Anobiids are 1/16 to 1/8 inch in diameter, round in shape. Cigar-shaped frass is found loosely in tunnels and in small mounds outside of emergence holes. The frass is powderlike but feels gritty to the touch. 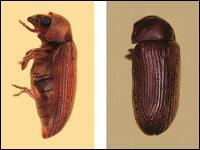 Bostrichid powder post beetles ( Figure 3 ) are 1/8 to 3/4 inch long, reddish brown to black in color. Their bodies are elongated and cylindrical with a roughened thorax. Heads are concealed by the pronotum from above; the antennae are short with 3 or 4 enlarged sawtoothed terminal segments. The larva is white, "C" shaped with no spines on body ( Figure 4 ). The life cycle is 1 year. Bostrichids infest seasoned softwood and hardwood; especially unfinished floors, window sills, furniture, etc. in CT. Bamboo items are especially susceptible to attack by some species of Bostrichid beetles. CREDITS: James Castner, University of Florida Figure 3. Bostrichid powderpost beetle. CREDITS: University of Florida Figure 4. Bamboo borer (Bostrichidae). The round emergence holes are 1/8 to 3/16 inch in diameter. Sawdust-like frass sticks together and is found tightly packed in galleries but not in entrance holes. Lyctid powder post beetles ( Figure 5 ) are about 1/4 inch long, brown in color, body elongated and slightly flattened, prominent head not covered by pronotum, and antennae with a 2-segmented terminal club. The larvae are white, "C" shaped, with 8th abdominal spiracle enlarged. This beetle's life cycle is 6 months to 4 years. Lyctids infest the sapwoods of hardwoods; mainly ash, hickory, oak, maple, and mahogany in CT. Consequently, most infestations are found in wood paneling, molding, window and door frames, hardwood floors, and furniture. Imported tropical hardwoods are especially infested with Lyctids because of poor storage and drying practices prior to shipment to the U.S. Joists, rafters, and subfloors of houses are not usually infested with Lyctids because they are usually made of pine or other softwoods. The larvae of the old house borer (a long-horned wood boring beetle - Cerambycid) sometimes infest softwoods in Florida. The adult beetle is grayish-black, 1/2 to 3/4 inch in length with several white markings on the wing covers and long antennae. The female lays eggs in crevices of logs or timbers. The larvae hatch and require 3 to 5 years or more to mature. The larvae are 1/2 to 1 1/2 inches long and are white, segmented and have an enlarged, brownish head (Figure 8 ). They bore through the wood making irregular galleries. During quiet times, their feeding may be heard as a clicking or rasping sound. The beetles emerge through an oval hole about 1/4 to 3/8 inch in diameter. The key to avoiding serious problems with old house borers is early detection and control. Usually, homeowners see the damage rather than the beetles. The larval damage occurs entirely below the surface of the wood where larvae eat tunnels. However, their frass occupies more space than the volume of wood that is consumed. Therefore, they fill the tunnels in the wood completely causing a blistering or rippled effect. The frass is a fine, powder-like dust that is found loosely packed in tunnels and in small piles outside of the hole. The frass is extremely fine and feels like talc but usually has small pellets of frass mixed with it. Adult emergence holes are oval and 1/4 to 3/8 inch in diameter. 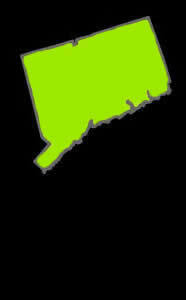 There are several options in CT for control of powder post beetles and old house borers. Selecting the best option depends on a number of factors, such as the severity of infestation, the location of infestation, potential for reinfestation, and cost of treatment. Powderpost beetles and old house borers damage wood slowly so there is plenty of time to make a decision on control options. Most CT powder post beetle problems are introduced into homes in lumber or finished wood products (e.g., furniture, paneling, or flooring). Most serious infestations occur when infested wood is installed in the house. 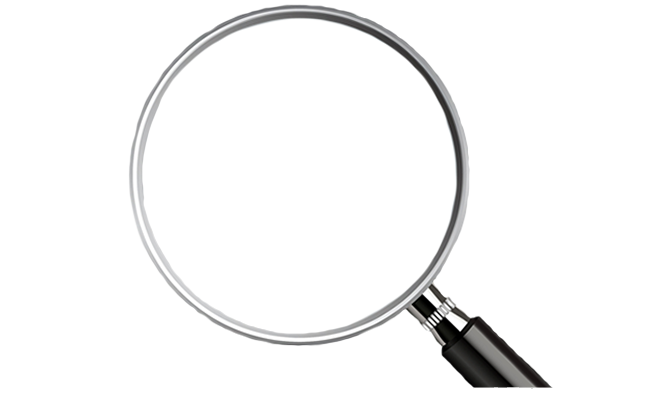 Inspect wood to insure that wood is not infested at the time of home construction. Powder post beetles only lay eggs on bare, unfinished wood. Beetles will not infest wood that is painted, varnished, waxed, or similarly sealed. Powder Post Beetles emerging from painted or varnished wood were either in the wood before finishing or were a result of reinfestation by eggs that were laid in emergence holes of adult beetles. Sealing holes prevents reinfestation from eggs laid within the hole. Infested wood can be replaced if the infestation appears to be localized. For instance, if emergence holes appear in a member of a door or window frame, the piece can be removed and replaced with a new, uninfested wood. Insecticides are labeled for surface treatment of bare, exposed wood. Spraying or brushing insecticides onto infested wood creates a barrier that kills adult powder post beetles & old house borers as they chew their way out of wood. The barrier also kills newly-hatched larvae as they attempt to bore into wood. For the surface treatments to work properly, they must penetrate the wood. Therefore, the wood should be unfinished or sanded to remove the finish. In certain situations, the surface treatment can penetrate the wood sufficiently to kill larvae within the wood to prevent the further marring of the surface by additional emergence holes of adults. Fumigation is considered the most effective method of controlling powder post beetles & old house borers. However, fumigation can be the most costly method of control and does not provide residual protection of the wood. Only pest control operators certified to apply fumigants can do fumigation work. Fumigation of infested furniture or small articles like picture frames and baskets can be done without fumigating the entire structure. Some pest control operators and exterminators will fumigate infested furniture inside fumigation chambers at their business so that the entire building does not need to be tented and fumigated. This document is copyrighted by the University of Florida, Institute of Food and Agricultural Sciences (UF/IFAS) for the people of the State of Florida. UF/IFAS retains all rights under all conventions, but permits free reproduction by all agents and offices of the Cooperative Extension Service and the people of the State of Florida. Permission is granted to others to use these materials in part or in full for educational purposes, provided that full credit is given to the UF/IFAS, citing the publication, its source, and date of publication. 11/29/04. Call our beetle control CT specialists today to schedule an appointment 888-558-1574.